Hello and a very happy Friday to all! Today I'm in the country mood with this fun card I've made using the Chicken Scratches stamp set by Newton's Nook Designs. 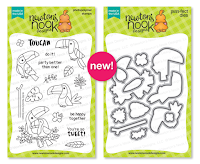 Here's what this cute little stamp set looks like! 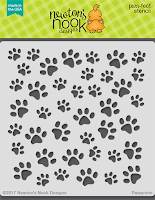 I used a dotted patterned Embossing Folder to create my background on some light blue cardstock. I cut the hill using the Land Borders die set, then added a few strips of polkadot and black papers along with twine. I glued the hill onto my background, then added my chicks and a few little dots of feed on the ground. Lastly, I created a banner, using the cute little piece of chicken wire I stamped and cut out, then glued down next to the sentiment! I added a few red matte enamel dots on the banner too. 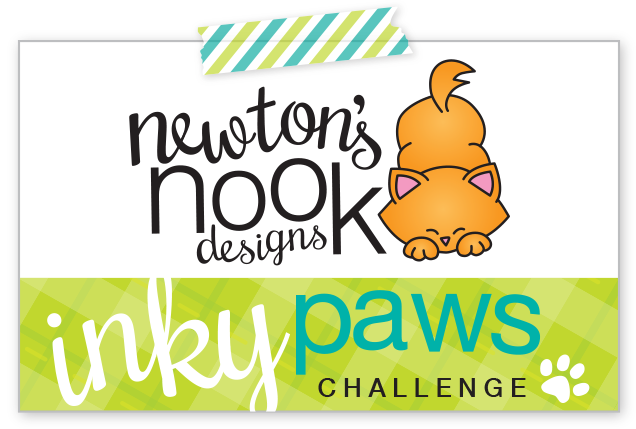 Thanks so much for stopping by, make sure to visit the Newton's Nook Designs store to check out the products I've used and more! Newton's Nook Designs 4 Year Celebration Blog Hop! Hello everyone and welcome to the 4 year celebration blog hop here at Newton's Nook Designs! 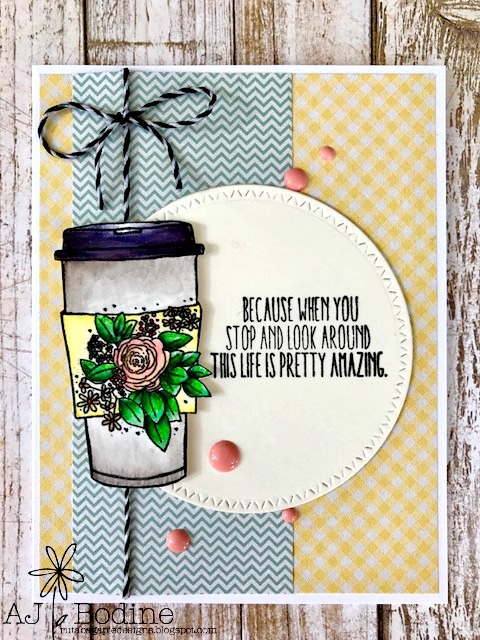 I'm so excited we get an extra day to show off these gorgeous products from the July release! 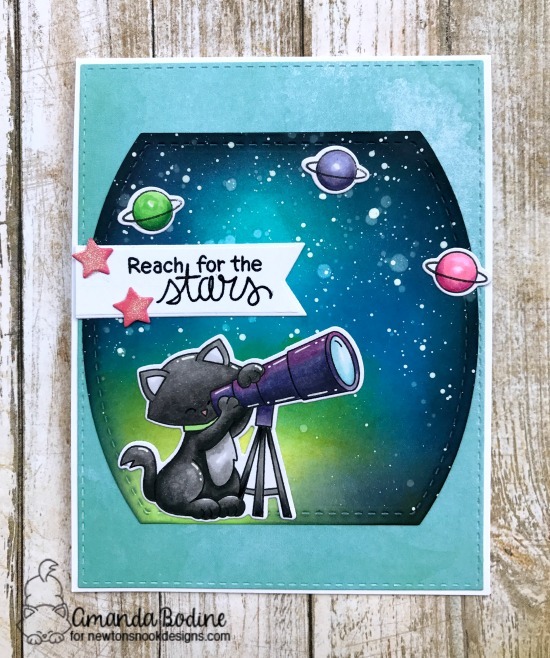 I chose to make another project with "Cosmic Newton" stamp/die set. It was so hard to choose, but I love creating night skies and this image of Newton with his telescope really spoke to me. 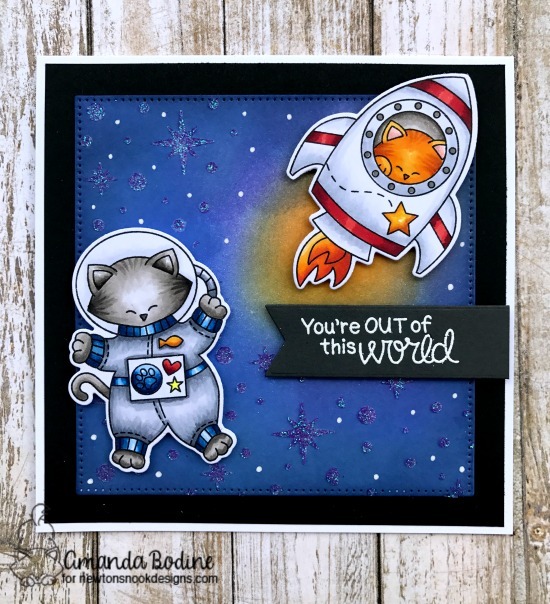 I started with the largest die from the Stitched Nested Creative Square by Studio Katia and inked it in multiple darker blue and black distress ink tones. I knew where I'd be placing my Newton image and wanted it to look like there was a beam of light shining down on him. For that area I used some Peacock Feathers and Twisted Citron. After it was all dry, I splattered with a little water and watered down white acrylic paint to create outer space. I copic colored Newton and the tiny planets and placed them in the scene. 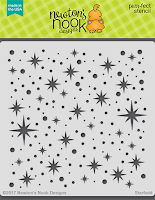 Lastly I cut out a banner and heat embossed the sentiment in black and added a few tiny pink stars. I hope you've enjoyed my project for this special event and I really appreciate your comments! Keep scrolling for the list of participants in this hop, make sure to comment on every blog for more chances to win! Check out this sweet bonus! 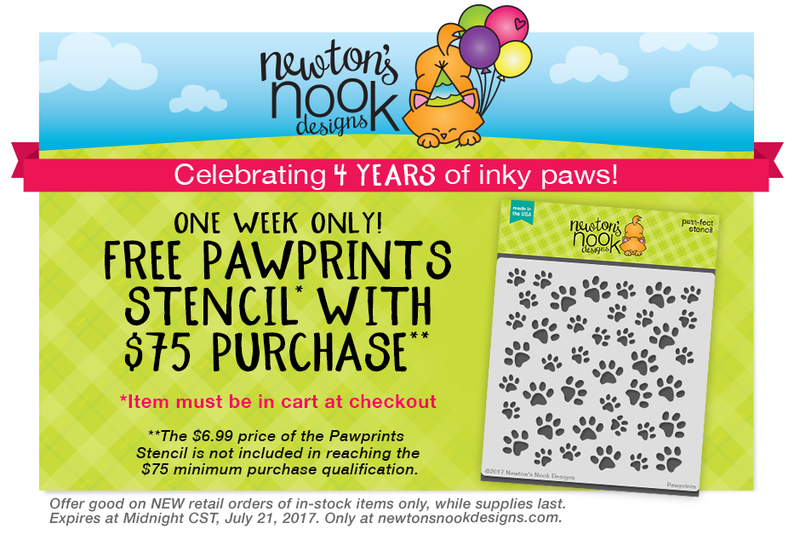 Place an order of $75 or more and receive the NND Pawprints stencil! Offer good through July 21st or while supplies last! Hi everyone and happy Thursday, it's going to be another GREAT reveal day today. 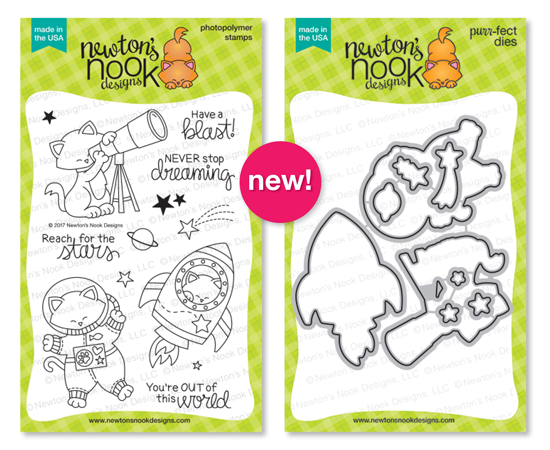 Omgoodness, I'm head over heals on this Cosmic Newton stamp/die set! That rocket and space suit with the Newtons inside, too cute!! I started with a 5x5 card base and die cut a smaller pierced square which I inked up in multiple blue shades of distress inks. Also a little bit of fossilized amber ink behind the rocket! Once dried, I used the Tanzanite Nuvo glitter paste over the brand new Starfield stencil by NND. I filled in the extra areas with some dots from my white gel pen. Once the panel was dried, I foam tape mounted both Newton images and added a banner with a white heat embossed sentiment from the set! Thank you SO much for joining me today and for your sweet comments! 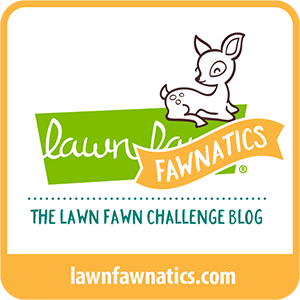 Don't forget to leave comments at all the blogs for your chance to win! 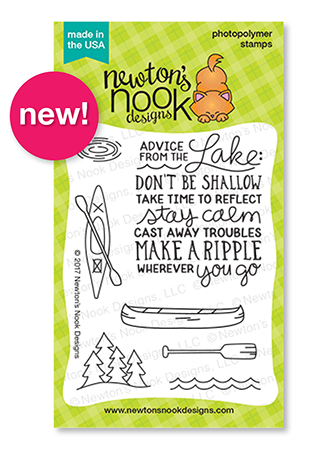 Welcome to day 3 of our birthday celebration over at Newton's Nook Designs! 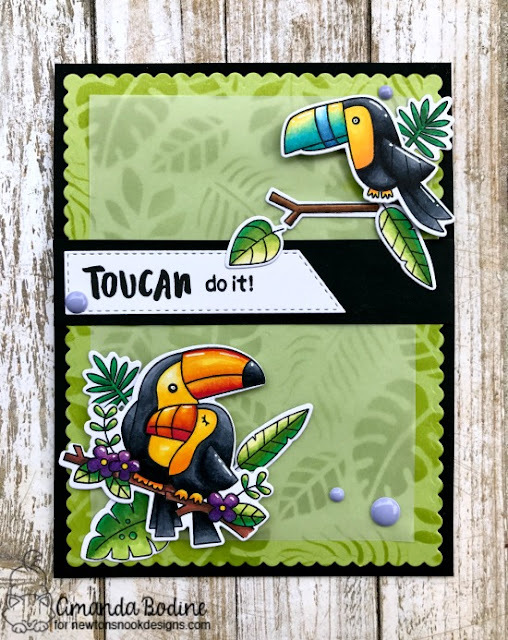 Today we've got another amazing stamp/die set to show you called Toucan Party! What an absolutely beautiful creative set! 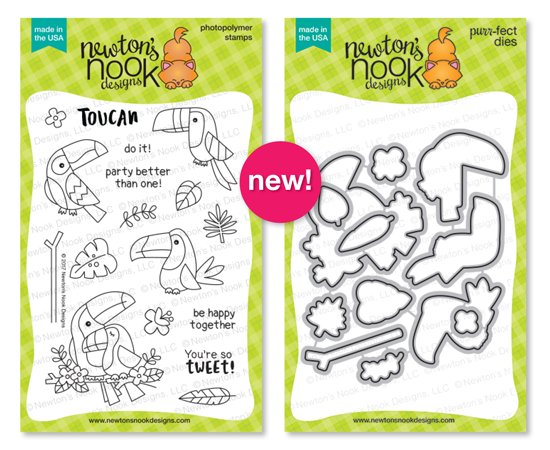 Did you know there are a thousand ways to color a toucan?! Google it, you'll be amazed! Well, here's my take on these gorgeous birds! 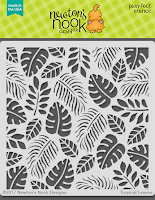 I used this brand new Tropical Leaves stencil on Green Apple cardstock by Simon Says Stamp and a very light touch with Mowed Lawn Distress Ink while shading over the stencil. 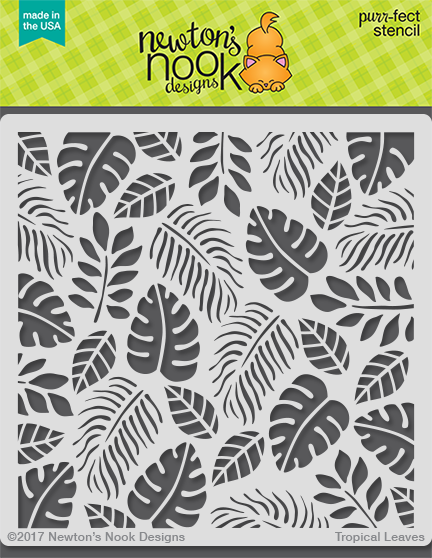 The green panel was die cut using the outer frame of Femme Frames by Mama Elephant. I then covered with a smaller piece of vellum and mounted my Copic colored toucans with a banner and some cute enamel dots! Thanks for joining me today and thank you for all your sweet comments which I appreciate so much! 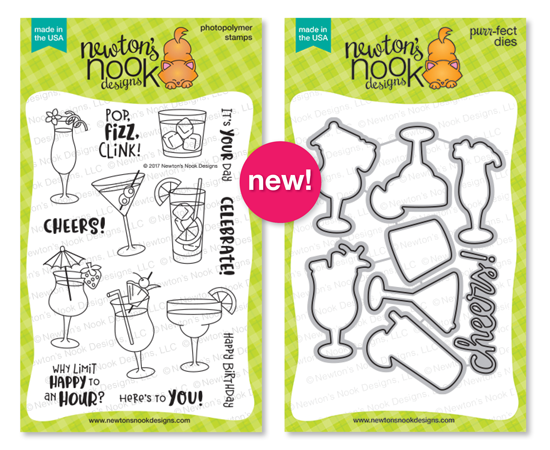 WooHoo, it's Day 2 of the July release and we're still partying, celebrating Newton's Nook Designs 4th birthday! I'm so glad you're here joining us! 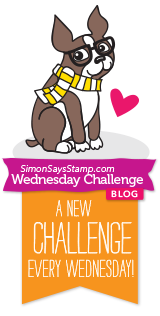 Today I've got 2 more stamp/die sets to share with you and I think you're going to looooove them, just like I do! 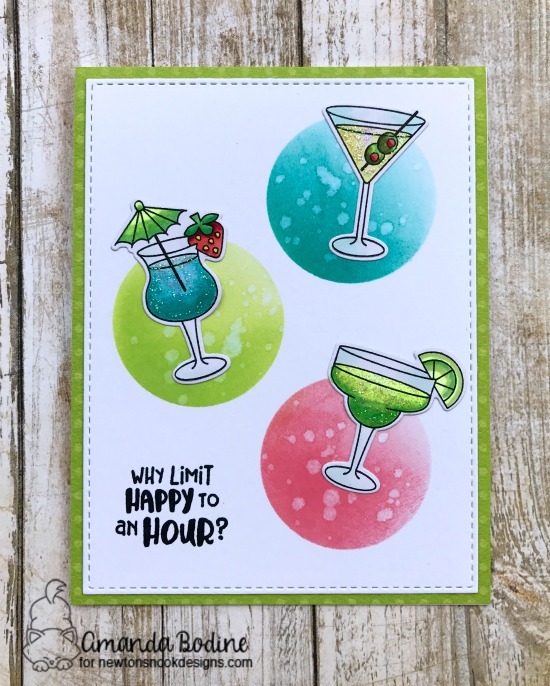 First off, Cocktail Mixer stamp/die set..aren't these little drinks fun!! I started off distress inking 3 round spots in Peacock Feathers, Twisted Citron and Worn Lipstick distress inks, then did a little water splatter on them for a bubbly look. I colored up a martini, a blue Hawaiian and a margarita with my Copics and added some Stickles to the drinks for sparkle! 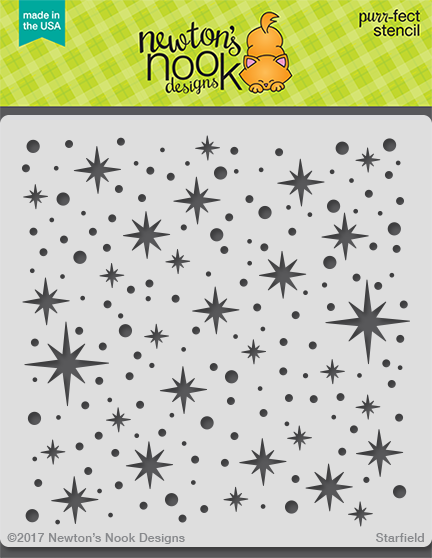 Next I'm sharing a card I made with Stowaway Newton stamps/dies. I just love Newton snuggled up in the clothes on a stack of suitcases! This was a fun image to Copic color. 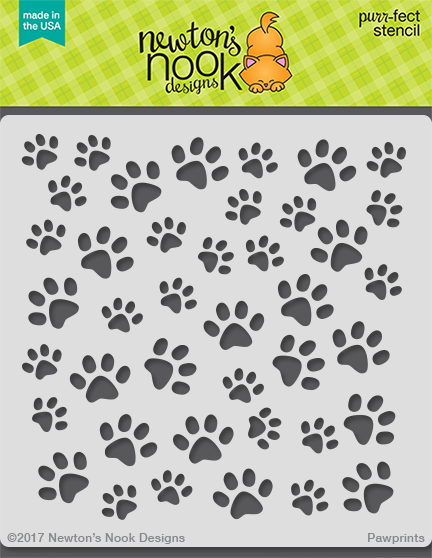 I then die cut a circle from vanilla cardstock and distress inked the new Pawprints stencil lightly using Tea Dye distress ink. 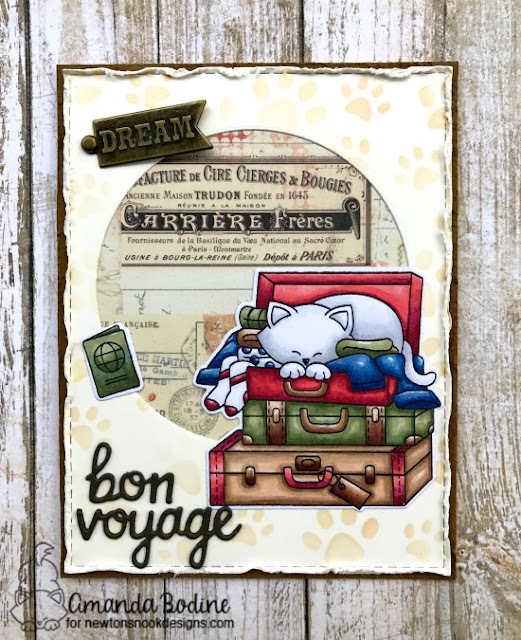 I added the Bon Voyage die cut that comes with the die set and used some old 7 Gypsies papers I had as a background inside the circle. It has a bit of a shabby look and I thought that paired well with the luggage. Thanks so much for joining me today, keep scrolling for a chance to win! 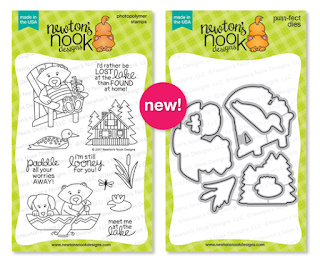 Hello Newton fans! 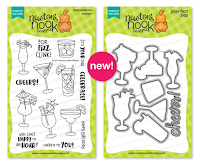 I'm so excited about this July release, not only do we have A-Mazing new stuff to show you, but it's also Newton's Nook Designs 4th birthday celebration!! 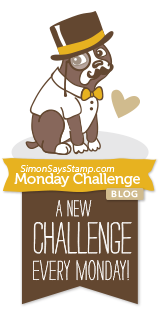 So be sure to join us here all week long for new product reveal, inspiration and prizes..keep scrolling to learn how to win!! 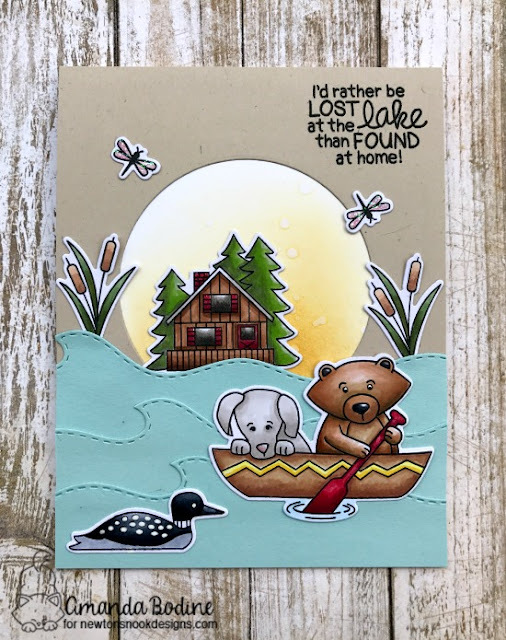 Today I'm showing off cards I've made with 2 new stamp sets, Winston's Lake House w/coordinating dies and Lake Advice. Winston's Lake House stamps/dies are all Copic colored. 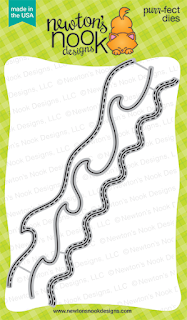 I cut the waves out using the new Sea Borders die set. 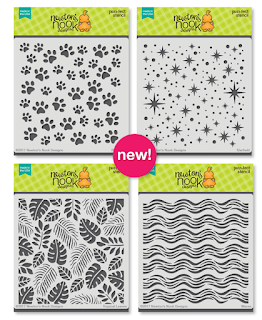 All July release NND products are pictured below! 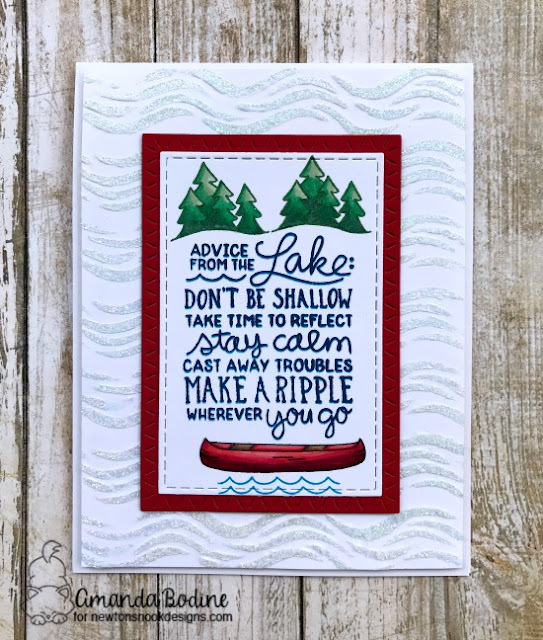 Lake Advice stamped and Copic colored. I used the new NND Waves stencil, first with a light inking of Tumbled Glass distress ink. Then I went over the ink with Nuvo Moonstone Paste to create the rippling waves on my background. 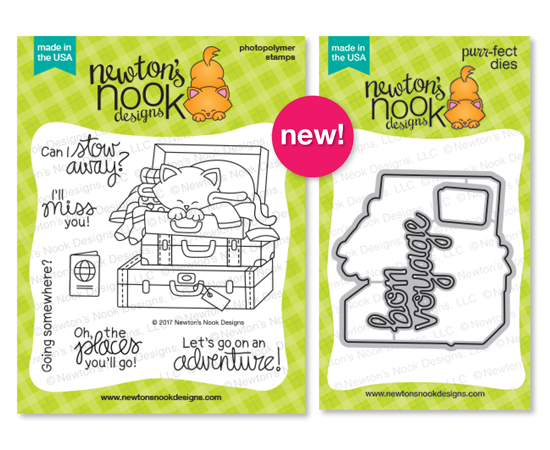 In addition to these great new stamps/die sets, we're also featuring the new Sea Borders die set AND brand new STENCILS in the NND line! I'm a huge stencil fan and these designs are just gorgeous. 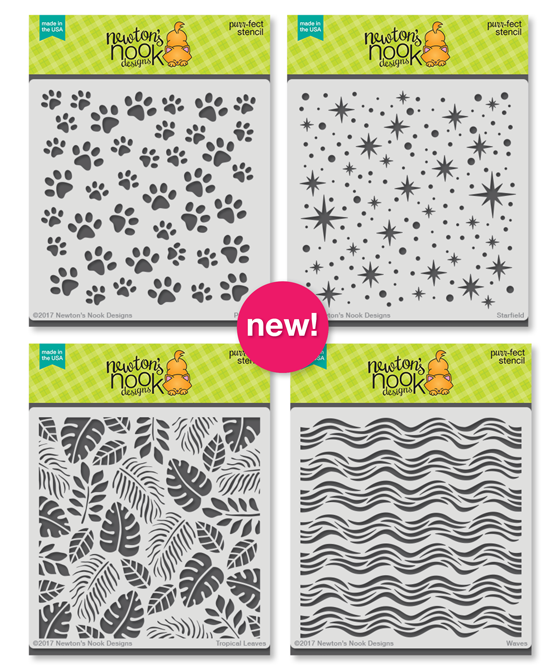 So stay tuned for more stenciling projects this week!